With some retaining wall projects you may have surface water that is difficult to divert from your wall. This water should be collected with surface drainage swales and drained laterally in order to disperse the water around the wall structure. This swale should include an impermeable layer of clay, asphalt, or concrete. For more on construction of a typical swale, reference Drawing No. 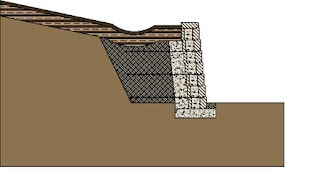 2.0, or see Chapter 12 in the Allan Block Spec Book for further discussion on above wall considerations.